Recently, some articles with the topic “the most beautiful library in China” have been forwarded tens of thousands of times on Weixin and Weibo，two major media platforms in China. Now, everyone knows that there is a fabulous library which you can’t imagine appears in Tianjin. Why has it become so popular in a short period of time? Besides its charisma, what else? 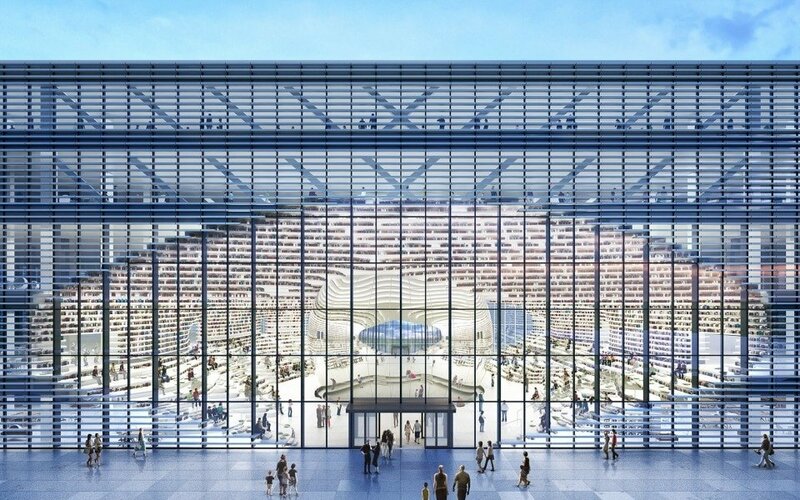 Tianjin Binhai library, designed by MVRDV and Tianjin Urban Planning and Design Institute (TUPD), becomes an important component of the cultural center of Tianjin. Locating between a park and cultural district, the library considered as an education center and the bridge connecting the nature and the city. An oval opening, as an eye gazing into the world, punctured through the building. A mirrored sphere, which takes the main stage within the atrium, enlarges the perceived space within. 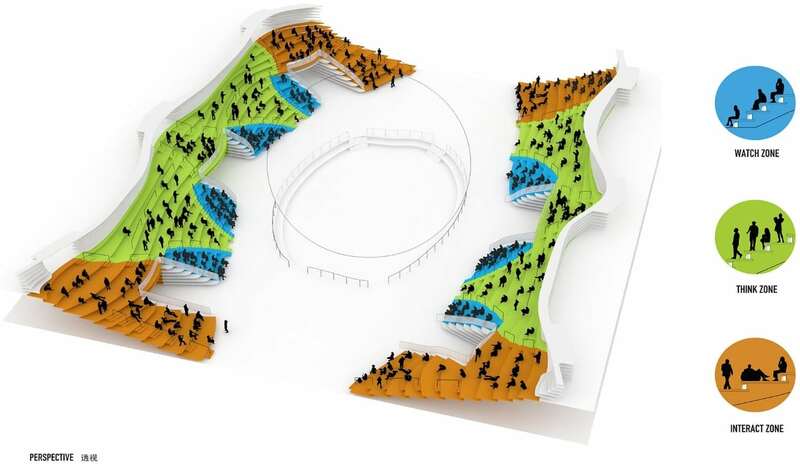 Stairs that stepping up were designed as some bookshelves and create a landscape of stretching thousands miles mountains, echoing the sphere space. What’s more, they reach out and wrap around the façade. In this way, the stepped bookshelves within are represented on the outside, with each level doubling up as a louver. When I look into this photo, I start to perceive that there is something else, like the magical power，to make the library so hot in China. The photo of the library showcases its fictional façade vividly. People around the building, walking or sitting, create an active scene. I was shaken by this photo that presenting perfect streamlined façade as if you threw a pebble in a pool and it rippled. Everyone who has seen this photo will be impressed by its visual impact. As the core of the building, the eye, actually, is a lecture hall equipped with 200 telescopic seats. Stairs with innovative design contain tens of thousands of books and allow people to sit, read, and walk around, which creates an active public space. Waving stairs undulate from the ground to the top. The top of the library looks like cathedral-like vaulted arches. In the future, the library will be surrounded by four other cultural buildings designed by an international architect team including Bernard Tschumi Architects, Bing Thom Architects, HH Design, and GMP. All of these five constructions will be the essential component of the cultural zoon in Tianjin. On the five levels of the library, there are different kinds of educational facilities, while the service spaces, book storage, and a large archive are located on the subterranean level. Reading areas for children and the elderly are located on the first floor, which is easy to access. The main entrance access to the cultural complex, the auditorium, and terraced bookshelves access to the floors above. The second and the third floors consist primarily of reading rooms, books and lounge areas whilst the top two floors also include meeting rooms, offices, computer rooms and audio rooms. Totaling 120，000 square kilometers, the aim of the Binhai cultural center designed by GMP, a German architect, is to add unique features to Binhai district. MVRDV’s project will be the junction point for the CBD, old town, residential districts, commercial areas and the government quarter; hoping to compensate for any missing programme in each. I didn’t realize that those pictures of the library are 3D renderings until I have seen all these pictures again. How amazing they are! 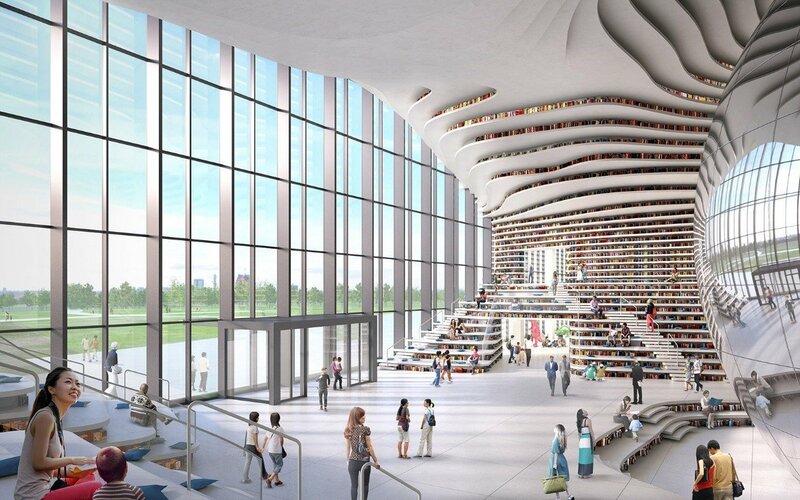 Without those 3D visualization pictures, I think I can’t imagine what the library looks like if I am not at present, not to mention before the buildings were completed. The reason why the library has come so popular in such a short period of time comes to my mind. 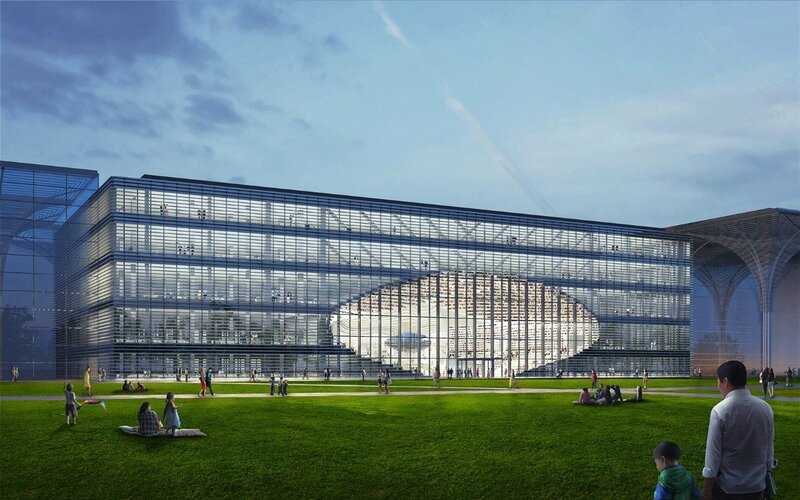 Netizens are totally conquered by those 3D renderings and they can appreciate the beauty and innovative design of the library through these pictures. 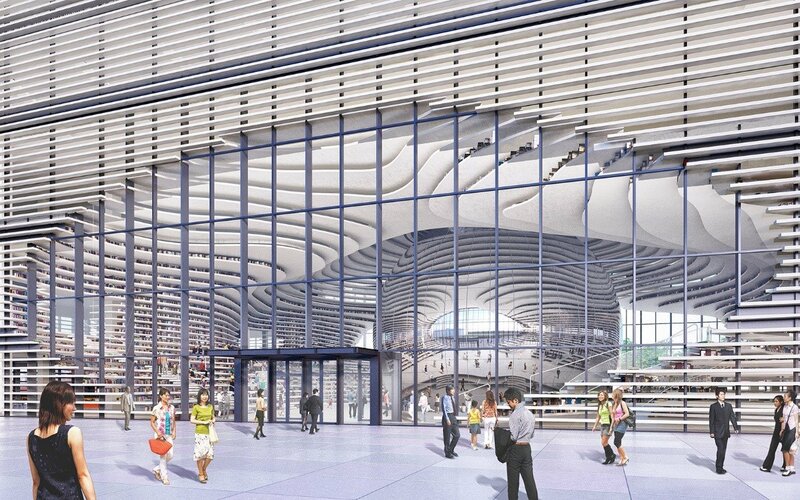 Especially, people will love the library at the first sight when they see it itself or the 3D renderings. Do you want to promote your architectural works with this kind of 3D rendering pictures? You can contact AIMIR for any kind of services you want. AIMIR CG is an architectural visualization company which has offered lots of excellent works for our clients, strengthening their competitiveness. 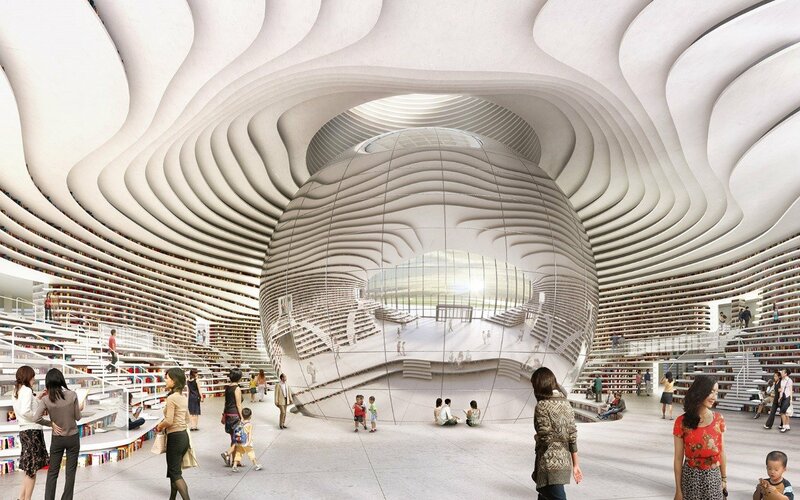 If you promote your constructions by using AIMIR’s 3D renderings, you will find it take the world by storm just like what the Tianjin Binhai library did. Wow, that’s cool. At the first sight, I also couch the wrong view that those 3D renderings are some photos. What actually make me sprised is that the power of the 3D architectural visualization. Is it really makes a difference when a architects bid for a project or marketing their works? There is no doubt that 3D rendering technology is gradually supersede the traditional way of showcasing a building. It is not only because the vivid scene those 3D rendering pictures show, but also it can fulfill whatever you want. 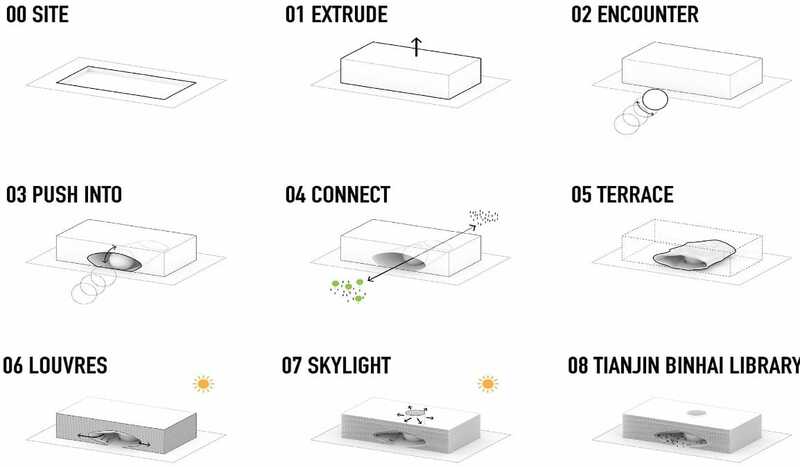 These 3D renderings can present a building from different angles under different weather condition, which other methods can’t do, and it can show the view that the building was completed and people were walking though around it.